Bukit Bandar Raya, Kuala Lumpur. WITH new items added to the menu, diners can enjoy a selection of Western and Asian cuisine at the elegant yet casual ambience at WIP@BSC. WIP, located in Bangsar Shopping Centre, was first known as Work in Progress and is now called Whipped into Place. Inspired by the relaxed elegance of Nice, France and Santorini, Greece, the interior design allows natural lighting and the use of the five elements to enhance the ambience. There are several choices for seating options – from the dining room to the lounge near the clam bar, the garden offers ambient sounds of water or dine under the tropical sky at the Patio, sandwiched by verdant greenery. We were seated inside during the review but the relaxing urban-tropic garden setting outside looked inviting. 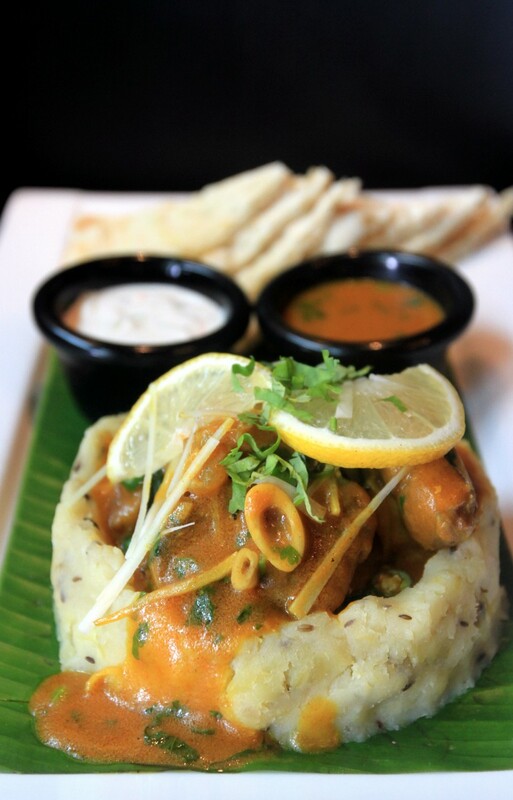 WIP’s menu features a mix of food from its Western, Asian, Northern Indian and Pizza kitchens. Nihari Gosht, lamb cooked with an Indian spiced gravy and served with naan. Also available are a wide variety of bar snacks for those seeking lighter options. 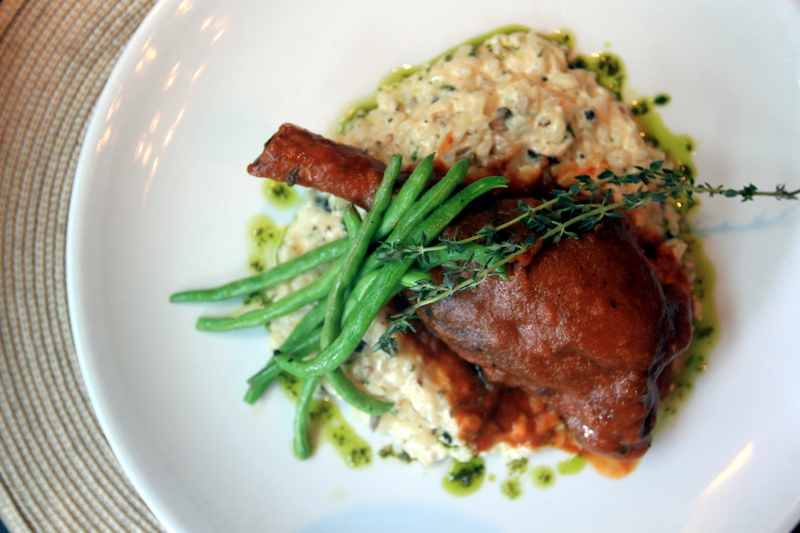 We were told that the items served during the review were among diners’ top picks. For appetisers, we were served Tomato Bruschetta, School Prawn and Popcorn Chicken. Of the three, I personally enjoyed the bruschetta because of the sweet cherry tomatoes while my colleague relished the prawns. I opted for the Garlic Pan Seared Salmon (RM42) served with black bean pilaf rice, kale, asparagus and chilli mango salsa while my colleague Sam chose the Alaskan Crab Burger (RM46) which is served with fries and tomato salad. She enjoyed the burger while the guest next to me was also pleased with her choice of Arroz de Morisco (RM42). 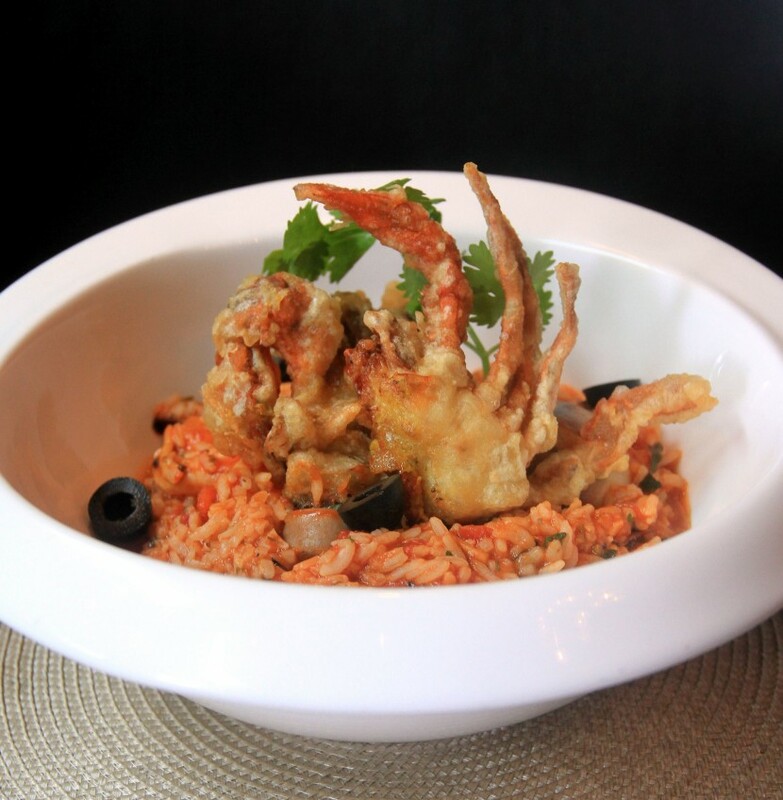 It is Portuguese seafood rice with soft shell crab, fish, prawn, mussels, clams, olive, coriander and beef chorizo. No wonder it is the house speciality. Other speciality dishes include espetadas, coastal aglio olio, seafood tower and lava cake. Other main course choices were Tiger Prawn Arabiatta (RM33); Lamb Shank (RM48) served with Creamy Mushroom Risotto (top pic), French Beans and Apricot Fig Jus; Nihari Gosht (RM42), Lamb Osso Bucco cooked with an Indian spiced gravy and served with naan and Triple Trio Supreme (RM38) pizza topped with chicken sausage, chicken ham, grilled chicken, and various cheeses. For desserts, we had Peanut Butter Pannacotta (RM15) and Tropical Pavlova (RM15). The pavlova was topped with a selection of fruits – the tanginess of the passion fruit balanced out the sweetness of the dessert. 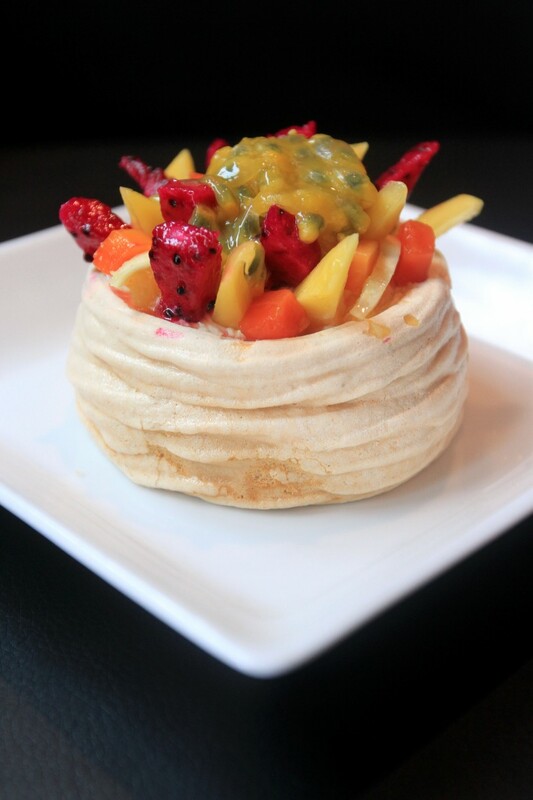 The pavlova is topped with a selection of fruits. The Lava Cake with Häagen Dazs Ice Cream (RM17) was definitely the highlight of my meal. The combination of ice-cream and cake, which was warm and moist, was a match made in heaven. The clam bar offers a comprehensive range of innovative beverages concocted by the resident mixologists. It features a selection of mojitos, complemented by premium cocktails, wines, Champagnes and spirits. Take your pick from 20 mojitos such as Koffee Karamel, made from coffee liqueur and caramel syrup; Madhu Rum with lychee puree, lemon, ginger, honey syrup; Bora Bora Rum, which has white wine, Blue Curacao; Spicy Cuban Rum, which has red capsicum and blood orange syrup. 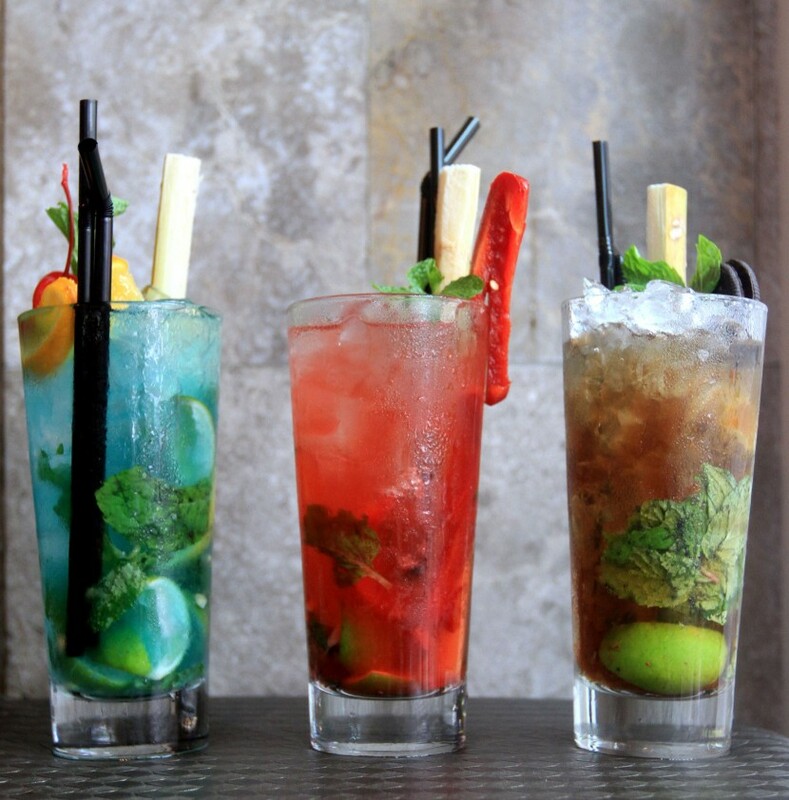 House specials: (From left) Bora Bora Mojito, Spicy Cuban Mojito, and Koffee Karamel. I opted for Kinabalu (RM18), a refreshing mocktail made from chilled orange and mango juice, mint syrup, yoghurt smoothie base, mint leaves, lime juice.